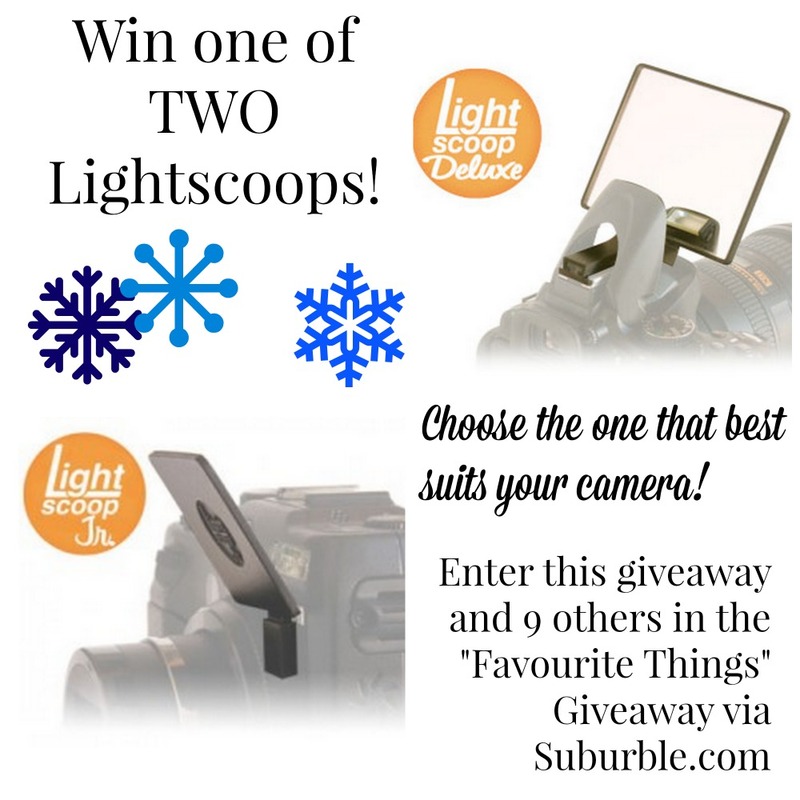 Our Favourite Things Giveaway: Two Lightscoops for Two Lucky People! Happy Monday, people. How many of you decorated over the weekend? Of course not all of you did, but December 1st (or around that date) seems to be the time when people dust off the glass balls and twinkle lights and deck their merry little halls. Today I bring you some potentially early Christmas presents. I’ve joined up with a gang of elves bloggers to present our favourite things – and then we’re going to give them away! At the end of this post, you’ll find links to 9 other giveaways that you’ll want to enter. They’ll only run for the week – so don’t wait! Okay- back to decorating. Obviously I love decorating for Christmas. It’s the spring in my step, the Bailey’s in my coffee. But sometimes, the low light, early sunsets and – let’s face it – non-stop artificial light blinking everywhere can really compromise your indoor photos. Incandescents are NOT your friend. They’re yellow. SO yellow. The sun is slipping below the horizon at 4:30 these days. This means that natural light is at a premium, and many photos – especially those after work and school – are going to be taken inside, sans sunlight. I’ve teamed up with the people at Lightscoop to offer not one, but TWO, readers the chance to make their holiday photos better. I love the Lightscoop – I wrote about it way back here. It’s a mirror that attaches to most cameras, that will bounce your flash away from the subject, but still light the room enough to avoid the dark and dreary winter photo. 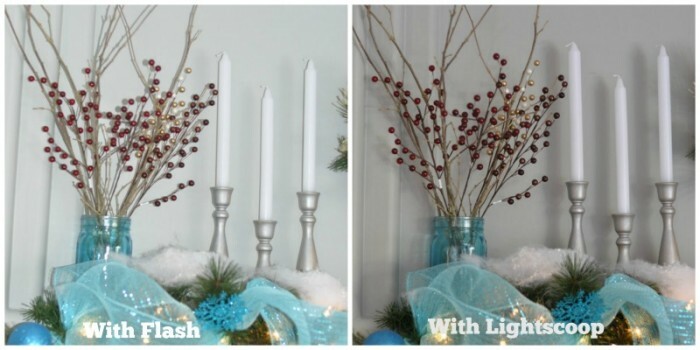 I borrowed this image from the Lightscoop website to show how the two different “light bounces” work when shooting indoors. I’m sure that you recognize the look of the left-hand picture. It’s common of any nighttime indoor shot. But with the Lightscoop, you can work with what you’ve got and still get great photos. While the light was dim, I grabbed my Lightscoop and slipped it onto the hot shoe of my camera. 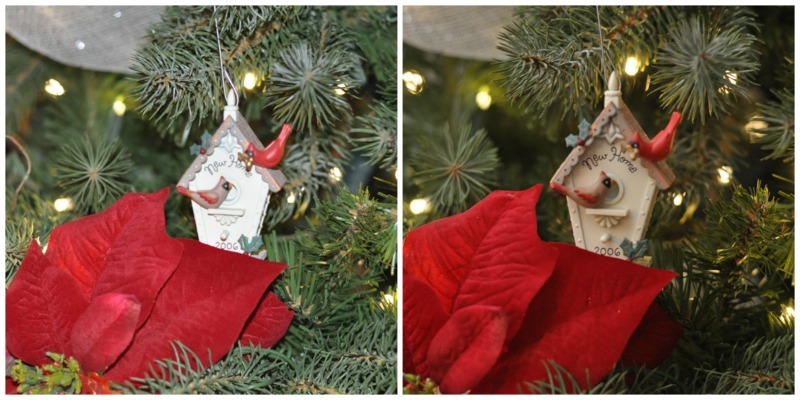 I quickly took a few snaps of my Christmas decor to illustrate how easy it is to improve your photos, just with this little guy. I will note: none of these photos are edited at all. They’re SOOC and even though that makes me cringe a bit, it’s better this way. First, the Christmas tree: you can see that with the flash, everything is glaring. 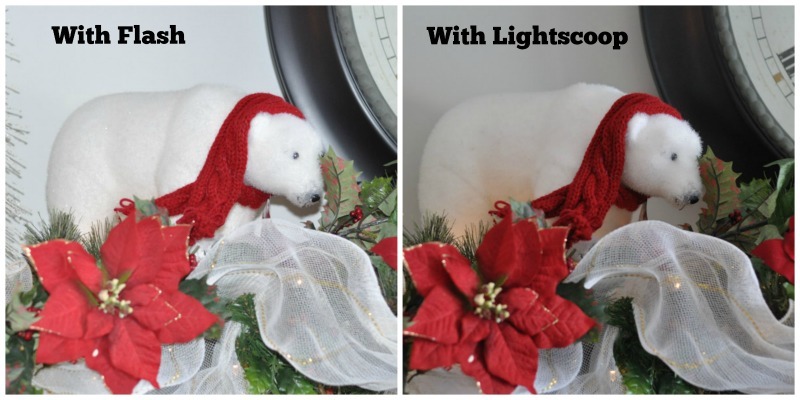 The Lightscoop bounces the flash away and makes everything that much more… realistic. And then the polar bear: his white fur is bleached right out by the flash. There really isn’t any dimension to the photo. On the right, there are just enough shadows to make the photo warm, and not so stark. The mantel in the family room. The flash really doesn’t do this mantel-scape any favours, does it? I feel like even the candlesticks look shocked. The right side is much nicer, don’t you think? The light was really fading when I took a picture of the birdhouse on the tree. Notice the difference! 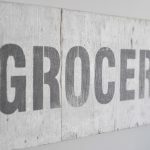 If you like your photos to be crisp and not scarily blanched by a flash, you can use the promo code – SUBURBLE – to get 15% off your order! Get one for you, or one for the photo buff in your life! 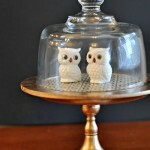 Lightscoop has generously offered up TWO chances for you to win one of these little babies. There is the Deluxe and the Jr. – you can choose which one is best for you. The Deluxe is for DSLR cameras, and the Jr. is for compact cameras. Keep it for yourself for your Christmas snaps, or gift it to a friend or family member who loves to take photos. Giveaway is open to residents of Canada and the United States. Giveaway will run from December 1st to 11:59pm December 7th. Void where prohibited. Fulfillment of prizes is the responsibility of Lightscoop. 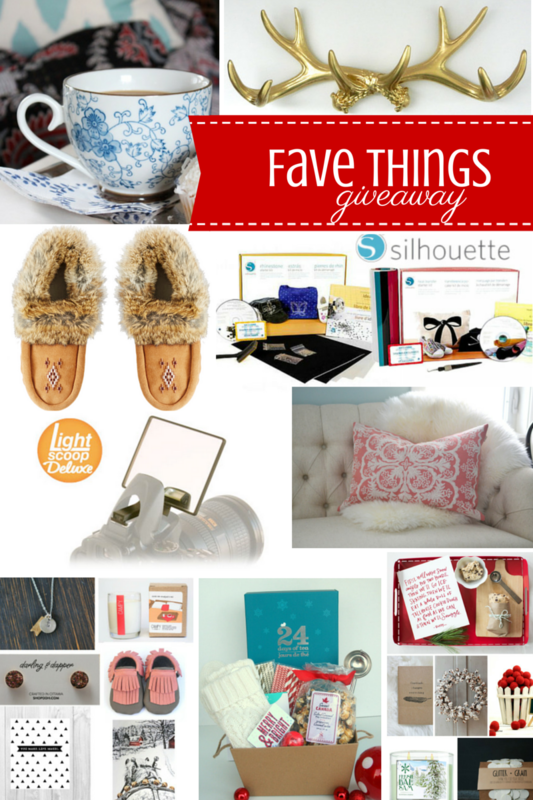 Enter the 9 other giveaways hosted by some of my favourite bloggers! It’s a celebration of our favourite things! i would love to try this. the dreaded flash is never turned on, but sometimes i need more light. this would be awesome. thanks. I’m a lousy photographer and really need all of the help I can get. This looks like it would be a huge improvement! This looks like just about the coolest thing ever, and as a fellow blogger, I totally want one! Taking pictures in the winter when there’s little sunlight is darn hard sometimes! 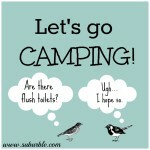 Tara, are you aware that you Rafflecopter widget is in this post twice? Hi Wynn Anne… I’ve been fighting with the code all day! It doesn’t seem to affect the entries – but it sure looks sloppy. I’m just starting to get into photography and this would be great to add to my camera bag! I fight with lighting in my house all the time so this would be an awesome addition to my camera. I would keep it, we do a lot of night trips and the flash is just so overpowering. I’m afraid I’d be keeping this one for myself. I’d love to give it a go. I give up on my DSLR too often because the flash is a bit too much and my photos look painfully bright. I’d keep it! I really try to just avoid taking pictures at night, but I miss capturing lots of memories that way. Would love to surprise my Daughter with this Christmas morning! I’d definitely keep this one for myself! I just bought my first DSLR a few months ago and would love to add this to my gear! What a great idea – i want one even if I don’t win it! 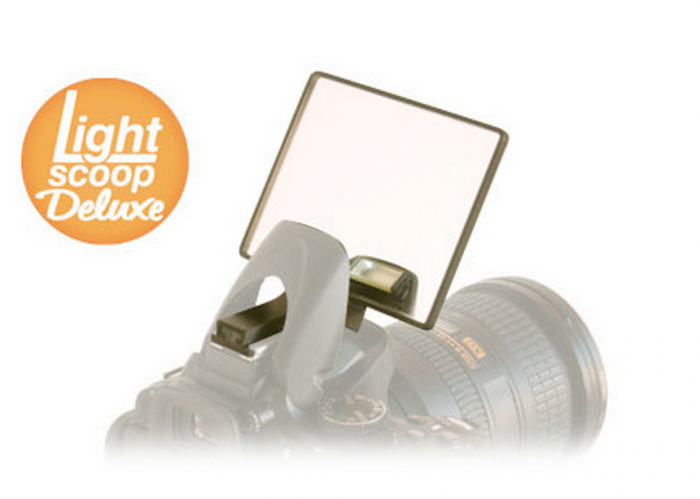 I would love to have this light scoop so that I can take better pictures in low light! I’ve heard of this recently, and would love to give it a try! The difference in the photos when using lightscoop is amazing! The flash is our enemy. Looks like lightscoop is the way to go! I met the fabulous people from Light Scoop at BlogHer and couldn’t believe the difference in the photos. I live in Vancouver where the weather is dark and dreary during the winter months. I end up having to take a lot of photos indoors during that time for my blog. I would love to win a LightScoop to keep for myself and use for my blog! I would totally keep it! I am always looking for ways to get my photos to look better! I would keep it! I’m always taking photos of daughter, I think this would help perfect them! I would definitely keep it! haha. I hate glaring flashes in photography… am always trying to use natural light to achieve better results in my photos. this would definitely help! I would definitely keep it for my food pics for my blog. I love my older models, but would love to try the new one. 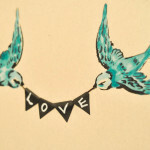 I could definitely use one for myself and my Etsy photos….not to mention just everyday photos. I LOVE my lightscoop. I’ve used it so much it’s looking a little worse for wear!!! I would gift this one if I won. I have one and it really does make a difference. I would keep it, as long as it fits my camera. I can’t find anywhere on their site that mentions whether it works with my model. It’s a “advanced compact” or whatever they call it, but it has the centre pop-up flash like bigger dslr cameras, but no “hot shoe”. I think it’s a brilliant idea! My wintertime pictures are always underexposed and grainy, or overly bright and washed out. I love my Lightscoop! It makes this blogger super happy 🙂 I honestly couldn’t get most of my craft pictures without it, especially now that the sun sets so early so there’s no natural light by the time I get home from work! Oh goodness – I so need one of these. If i’m not lucky enough to win I think it will have to go on my Santa list! I NEED to have one of these things… I feel like I’m racing the light every darn day! This looks like it would help my Christmas morning pictures!! Would love to capture those memories without the harsh flash. I would keep it for myself. I think it would work great with my camera and I could take better pictures. I would definitely keep the Lightscoop to myself if I won it! Our little house gets so dark in the Winter and all my photos look bad. 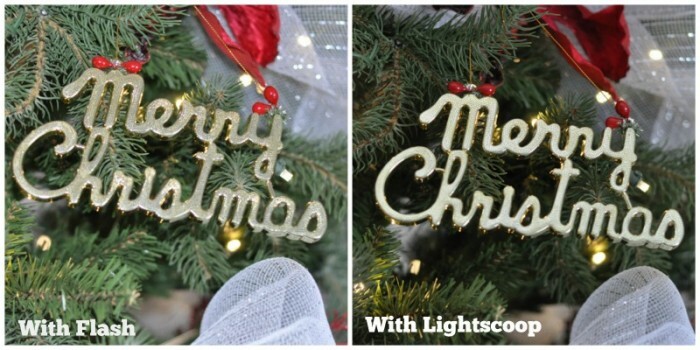 Thanks Tara for the chance to win and to learn more about Lightscoop – your side-by-side photos really show the difference. These are BRILLIANT!!! I was just grumbling to myself about this problem. Fingers are crossed I win one!!! I want it because those photos you showed are sooo much better! This would be fantastic! I always have trouble with flash photos and indoor shots.